The X-Fragments show early D&D at its most raw: in unnumbered, carelessly-typed pages which could have scrambled into pretty much any order; presented without art or attribution; and filled with hasty, abbreviated descriptions relying more on charts than discursive text. The draft is so primitive that we might wonder if Guidon was based on it, rather than vice-versa. There are however several system properties that demonstrate that isn't the case. Look for example at the Cleric level titles from the X-Fragments below, sandwiched between Guidon (on the left) and published OD&D (on the right). 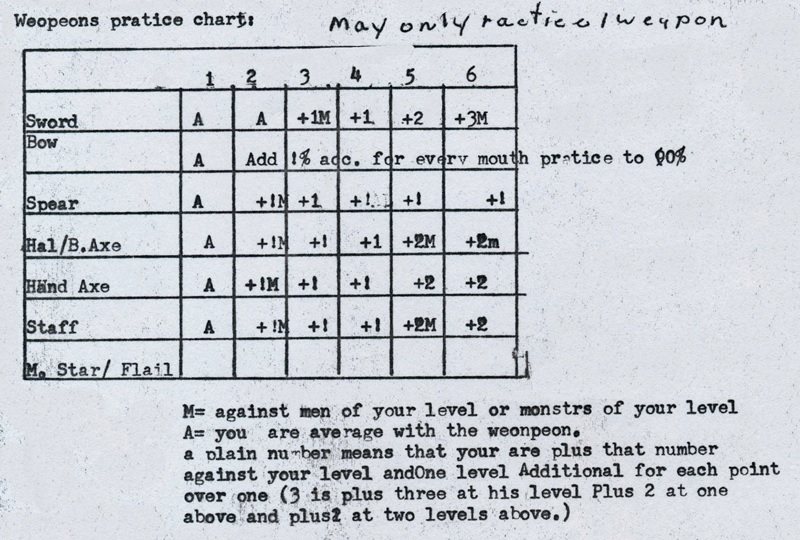 Cleric level titles are a good way to sequence early drafts because Gygax revised them, by hand, in Guidon -- but he only revised them in the table shown here, not in the "Statistics Regarding Classes" table (the one that lists hit dice and spells per level). So here, Gygax has successfully blotted out the second level title "Friar" with "Adept," but he neglected to do so elsewhere - an oversight he would later correct. Those who have seen the Dalluhn Manuscript may remember a lingering "Friar" in Table 4 which resulted from that inconsistency. The Twin Cities derivate of Guidon similarly retains "Friar" due to this contradiction in the first draft. We can see that the X-Fragments lack the "Friar" or the other original Cleric level titles and instead follow the corrected version, so it is unlikely they could be earlier than the Guidon draft. We moreover see that while the typist of the X-Fragments faithfully copied the experience point values for each level from Guidon, a later hand correction has increased them. OD&D would raise those experience targets as well, but by different amounts. From examples like this, as well as a few instances of sloppy copying, we can show that these pages contain fragments of a variant system derived from Guidon, rather than any earlier or later iteration. This is not the earliest spell point system, as we can already find them in Midgard back in 1971. 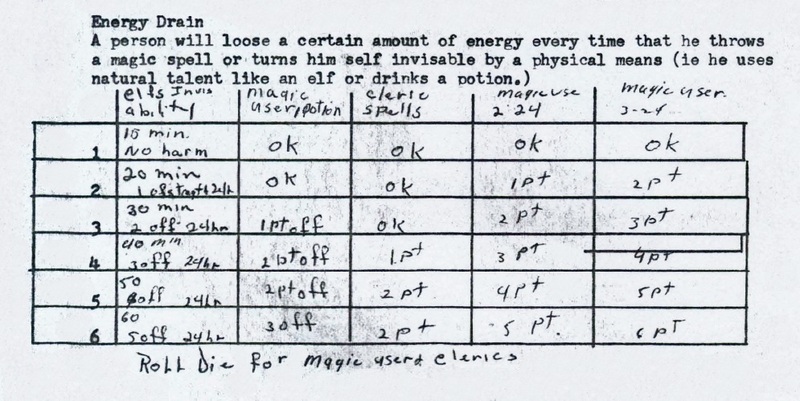 But this system is notable for having only a chance of spell point loss when spells are cast, and that furthermore, the number of Strength points lost is left to a die roll, rather than being based on varying power requirements of spells. 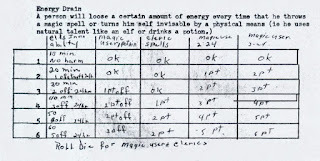 Although it would be an understatement to call this chart obscure, we might speculate that the right two columns, marked "magic user 2 - 24" and "magic user 3 - 24" show the tables that a Magic-user must roll against when casting the second spell in a day (a twenty-four hour period) and then the third: the spell point loss in the second case is incrementally greater. 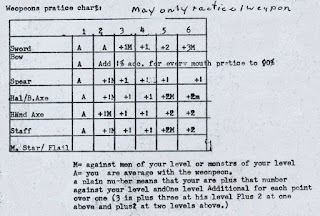 As was common in early combat rules, in this system you compared your level against the level or hit dice of monsters to determine how many blows you might strike, a system that ultimately derived from the "fighting-as-so-many-men"arithmetic of Chainmail. Training grants bonuses equivalent to ratcheting up your level when fighting with the weapon you practice. For bows, a simpler system lets you add 1% to your accuracy with each month of practice, as missiles rolls are made in this system with percentile dice. Not long ago, there was still much uncertainty around identifying pre-OD&D system. Now there are enough examples that some recurring elements, like the Prize Matrix, feel almost routine. But studying new sources like this reminds us how much we don't know, how much is still out there to discover about the history of Dungeons & Dragons. There are surely more things like this to unearth. Fascinating post Jon - again! But, to be clear, you are saying the variants in spells and combat are from someone other than Gygax, independently reworking the rules with their own ideas? I wasn't trying to say anything about who invented which ideas, just sequencing this with other related drafts. But broadly, I have no reason to think Gary or Dave made this document personally. Love this stuff. It's interesting that some of the sophistication D&D is often accused of lacking was actually there in early drafts but removed before publication. - spells: Glittering Eye, Redirect Edge Weapons, others?